Remember playing Tetris on your old GameBoy? How about the absolute classic Snake on your indestructible Nokia 3310? 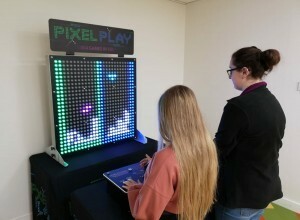 Now you can enjoy both those games as well as Pixel Paint and Pixel Paddles on our newest addition, PIXEL PLAY! With 4 games included and player vs player modes, you and your guests are going to be busy for hours! Or until your significant other pulls the plug. 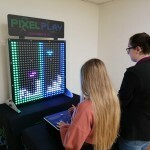 Pixel Python: Inspired by what was the first mobile phone addiction - it was initially used ona mobile phone than text messaging, the aim of the game is simple: be sure to keep feeding the Pixel Python but be careful of hitting those walls or its Game Over! 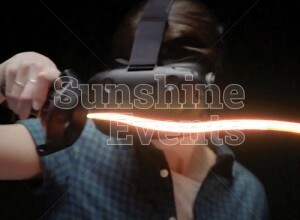 Available as a single player of 2 players can go head to head. Pixel Pieces: i.e Tetris. As the Pixel Pieces fall, stack them nice and neatly to gain points (OCD mode engaged). The more points you score the more the speed slowly increases bringing an extra level or pressure to the challenge. Pixel Paddles: Not to take the glory away from our very own Atari Pong Table, Pixel Paddles is also based on the 70’s classic. Use your joysticks to bat the Pixel to the other player and hit their wall to score a point. Careful not to concede to your opponent, otherwise you cost yourself a point, 3 points and its Game Over Man! Pixel Paint: Show your inner Banksy with the Pixel Paint. Select your own colours and then use the joystick to move and place the Pixel to where your artistic flare deems necessary. 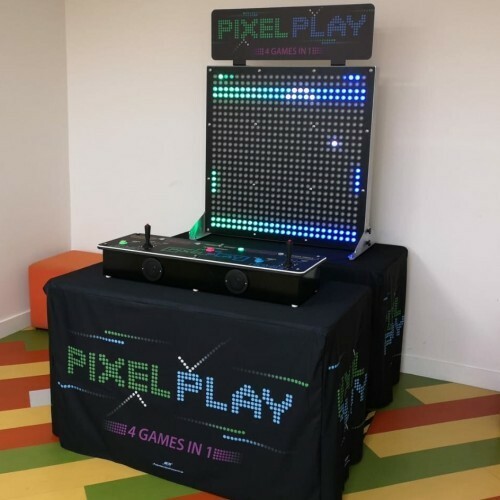 What events is the Pixel Play Hire suitable for? 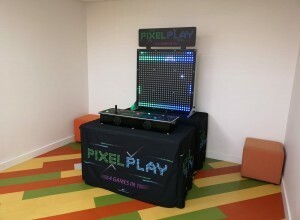 Pixel Play has been added to your Event Quote.